Iperius Backup is one of the most flexible and complete software to backup and protect your files and your reserved data. Tape backup software, DAT backup, LTO backup software, NAS backup, RDX drives, USB backup, zip compression, AES 256 bit encryption, online backup, database backup (Oracle, SQL server, MySQL, MariaDB, PostgreSQL), FTP backup, FTP Download and synchronization, Website backup, Dropbox, Google Drive, SkyDrive (remote backup), installable as Windows service, e-mail notifications, synchronization and open file backup. Windows 8 and Server 2012 compatible. it includes a Web Console to monitor all the backups, run backup jobs remotely, and update the program remotely. 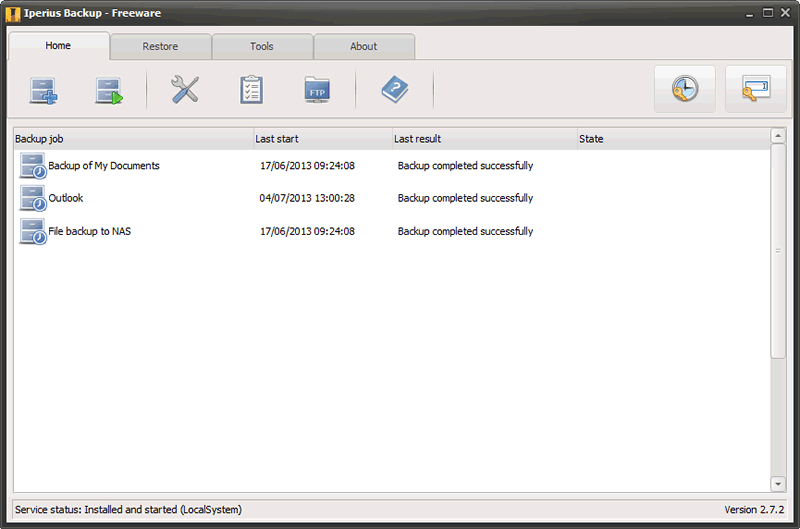 Iperius Backup can make backups to Google Drive, SkyDrive and Dropbox. The cloud backup configuration requires only a few clicks, and it guarantees the security of automatic remote backups. Disk imaging backup software, that allows to save the whole operating system with a fast block-level backup. Iperius can make images of the system disk, allowing to recover a server with a few clicks. You can also restore individual files, mount the image as a virtual machine, and restore the system to a dissimilar hardware (bare metal restore). Tape backup software compatible with Windows Server 2008 and Windows Server 2012. Iperius is easy to use, reliable, fast, and supports any tape drive, starting from the common HP DAT 72/160/320 USB/SCSI, to DLT/SDLT, and up to the high-capacity LTO 5 and LTO 6, that allows to back up hundreds of gigabytes.